May 29, 2013, 5:39 p.m. I linked earlier to Mary Meeker’s new slide deck. For those who don’t know it, Meeker — formerly of Morgan Stanley, at VC firm Kleiner Perkins since late 2010 — each year produces a curated set of data reflecting what she sees as the major trends in Internet usage and growth. It may be the only slide deck that qualifies as an event unto itself. The basic idea here is to compare the share of attention in various media to the share of ad spend. (This is U.S. data.) In other words: 43 percent of the time Americans spend consuming media is spent watching television. And 42 percent of the advertising dollars spent in America go towards television advertising. It’s a pretty good balance. While there’s no ironclad law that ad dollars will always perfectly follow attention, it seems like a pretty good working assumption. 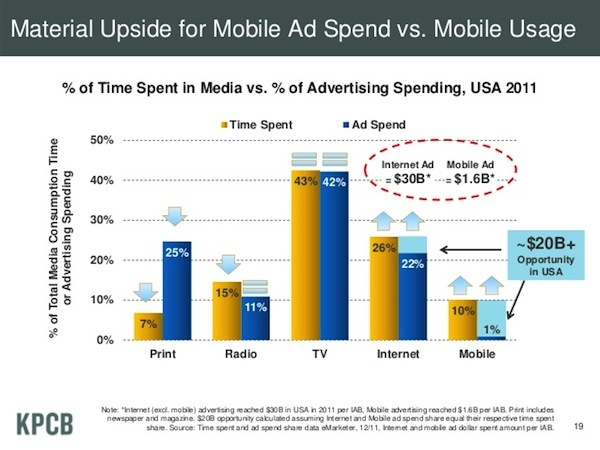 And the main takeaways from that slide are (a) that print still gets a wildly disproportionate share of ad spend (25 percent) when compared with time spent (7 percent), and that (b) mobile is in the opposite situation — lots of attention (10 percent) but not many dollars (1 percent). If you think that, all else equal, ad dollars will tend toward equilibrium with attention, that’s (a) a really scary thought for print — newspapers and magazines both — and (b) a sign that news organizations had better be putting a lot of effort into monetizing mobile. This picture isn’t any prettier. Print attention is down one percentage point; print advertising is down two. But the gap between them still yawns. Any time you hear someone be optimistic about the return of print advertising dollars, think about this slide and realize print ad dollars still have a long way to go down. Meanwhile, mobile is continuing its move in the opposite direction: up 2 percentage points in time spent, and up the same in dollars. Mobile advertising went from a $1.6 billion business to a $4 billion business in a single year. Not much of that went to newspapers. Benton, Joshua. "The scariest chart in Mary Meeker’s slide deck for newspapers." Nieman Journalism Lab. Nieman Foundation for Journalism at Harvard, 29 May. 2013. Web. 18 Apr. 2019. Benton, Joshua. "The scariest chart in Mary Meeker’s slide deck for newspapers." Nieman Journalism Lab. Last modified May 29, 2013. Accessed April 18, 2019. https://www.niemanlab.org/2013/05/the-scariest-chart-in-mary-meekers-slide-deck-for-newspapers/.